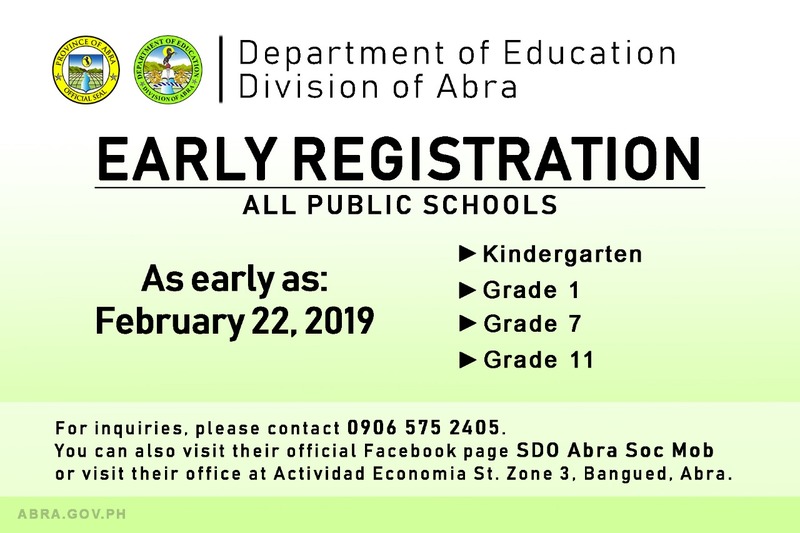 The early registration for school year 2019-2020 for incoming Kinder, Grades 1,7, and 11 started on January 26, 2019, and was conducted simultaneously in all public schools in the province. As of today, there are already 2,169 registered students in the province. DepEd Planning Officer Meldie Damian encourages the parents to register their children as early as January 26 until February 22, 2019. “Kadagiti parents dagiti ubbing nga agkindergarten, aggrade 1, grade 7, ken grade 11 umay da kuma iparegister dagiti ubbingdan nangrugi idi January 26 agingga February 22 tapno maiinclude da iti registration for the allocation of resources a masapol dagiti schools nu kumpleto dagiti tugaw ken classrooms nu umay danto nu mangrugi ti klase,” said DepEd Planning Officer. She also gave some tips to the parents for the early registration. “Kadagijay parents, nu umay kayo agparegister masapol nga itugot da diay birth certificate da, nu kaspagarigan a nag undergo da iti kindergarten catch up education program itugot da laeng iti certificate from the school,” Damian added.